Urine from either humans or animals will always leave a nasty smell behind in its place, even when it has been superficially cleaned. That is because the bacteria left behind doesn't go away so easily. We provide a full urine removal service which destroys the smell at its core ensuring that it will not come back again. We use professional enzyme cleaners to remove the stain and then odour neutralise your vehicle to quickly remove the smell. Urine odour in cars are particularly smelly because it is such a confined area and the odour can fester for a very long time. This is particularly problematic when transporting people or when you come to sell the car as the value will naturally be diminished. If you need a professional urine odour removal service, please don't hesitate to contact us either by phone, email or text for a quote. We use a 3 step process for all of our stain removal services so that you can understand what is required. These services are quoted separately from other services but can also be discounted if you combine it with an interior valet. Normally this is a pretty easy step when it comes to urine since it doesn't travel far from its source! Once we have detected where the urine is, we can start to clean it up. Urine is classed as a biohazard so we need to use professional and powerful enzyme cleaners to eradicate the bacteria. Since the nature of the stain can seep into the carpets, we need to completely soak the area. 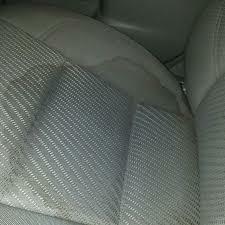 Once we have removed the urine stain fully, we can then either fog bomb the vehicle. This is an important step but can be skipped with urine stains since it does not tend to travel far. However, there is a chance urine bacteria could spread so we do still reccomend this step.